I just ran across a story about a 13 year old debt settlement business for sale in TX. I wonder if it is possibly connected to the new FTC law going into effect on October 27 of this year that is going to prevent these guys from charging all of their fees upfront? 13 year old Dallas Texas based company for sale specializing in consumer and business debt settlement. We operate nationwide with the exception of a few states. Our sales team works to help clients live a debt free life by eliminating unsecured debt to pennies on the dollar by professional negotiations with their creditors. We accept clients with $10,000 or more in credit card or total unsecured debt. The national average consumer debt amount equals $30,000. We charge fees of 14.9% of the debt enrolled. This creates residual income over a period of 12 to 15 months. Leads are driven through debt specific lead vendors, online search engine optimization efforts, and referrals from affiliate relationships with mortgage, loan modification and credit repair companies. The market is filled with businesses, families and individuals whom are experiencing financial trouble and in need of these services. The company has no debt. Cash flow information will be available to serious inquiries. Wait, back this truck up just a second. Lets look at this business model. They charge 14.9% of a clients total debt and this provides residual income over 12 to 15 months. Ok, so this business model will be illegal on October 27th of this year. So for $69,000 some lucky entrepreneur can be the proud owner of a business that is not in compliance with federal law, and get nothing but angry clients that have already paid their fees and are now looking for the promised services. Expansion Potential: Tremendous upside potential during the present difficult economic conditions and stable growth during normal economic expansion periods. With more advertising revenue committed toward sales, revenues can be dramatically increased to over one million dollars per year. Reasons for Selling: Owners have other business interests. Tremendous upside potential up to a million dollars a year? Do these guys have no shame? I don’t see any mention of the regulatory changes that will seriously impact this business model in the next two months. These guys seem to see the writing on the wall, and are hoping to lighten the wallet of some young entrepreneur before their business is worth less than nothing. The owners have other business interests? Ya could it possibly be because their current ponzi scheme of a debt settlement program is about to tank when new regulations don’t allow them to collect this “residual income over 12 to 15 months?” Naw, I bet that doesn’t have anything to do with it. If you are considering the purchase of a debt settlement program in this current environment, I just have one question for you. 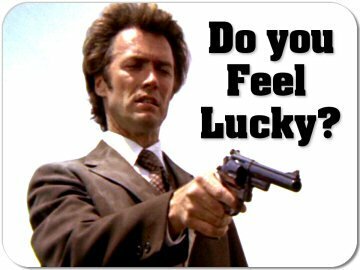 Do you feel lucky? There is a reason these guys will be trying to unload them. I worked for one of these companies for a while, and I think the government is going to start regulating them more and more….most have multiple complaints against them with the better business bureau. Strict regulations need to be placed on all the marketing and advertising gimmicks on the Internet. This issue is evolving as the biggest threat of the future. I never understand why people are selling businesses that they claim are generating a bunch of cash. Why would you sell a profitable business for under a years profit? Doesnt make sense. That is because the profit is a fairy tale. That may have been the profit last year, but when the new law kicks in next month and fundamentally alters their ability to be profitable, the company will be worth nothing. These guys are just hoping some unlucky entrepreneur will shell out some money without knowing what he is actually going to get. I had a chat with a company I used to work for who is an affiliate of LHDR. They are literally calling ANCIENT leads (I cant even call them aged leads), seem to spend no $ on marketing, and their salesforce is dropping like flies yet one of their offices recently purchased new equipment for them…I know LHDR has specific rules on what this company can and cannot say to prospective clients, but they are still charging upfront fees. Would you say that from studying their business model, that this company may go out of business? I told my friend who is still employed there that they may be trying to sell the branch off to an unwitting investor. I am currently interviewing with a company (in another city) that says they are not charging upfront fees, says they still have a healthy marketing budget and says they are doing things “the right way” by the Oct. 27th ruling, but I dont trust any company anymore. Are there still good companies out there to work for? Whether or not Legal Helpers will be going out of business I cannot say. I am not privy to their books, but they do also have a BK practice. My gut tells me that whether or not they stick around will have more to do with whether or not the FTC thinks they are in violation of the new TSR amendment or not. I have heard rumors that Legal Helpers is moving forward with what they are hoping is a loophole to send out sales agents to meet with clients face to face and hope to qualify under an exemption so that they can continue to charge their large upfront fees. Whether or not the FTC goes after them for that, which I am pretty sure they will, I just don’t know how that could work from a practical standpoint. I guess maybe they can sign up clients that don’t get on the internet and could easily see that most debt settlement companies don’t charge all their fees upfront. Plus this is 2010, who wants some stranger to come over to their house to pitch them debt settlement? In my opinion anyone that can’t comply with the new regulation, simply doesn’t have the ability to produce a high success rate among their clients and thus can’t profit without charging fees and not performing the work. As far as good companies to work for, we will have to wait and see how this whole thing shakes out. Honestly, large companies are going to have a very hard time with this, and really clients can be better served from smaller companies providing more personal service. My advice would be to find a smaller company that put people first and are doing things right. Not only can you earn a living but then you can actually feel good about what you will be doing.